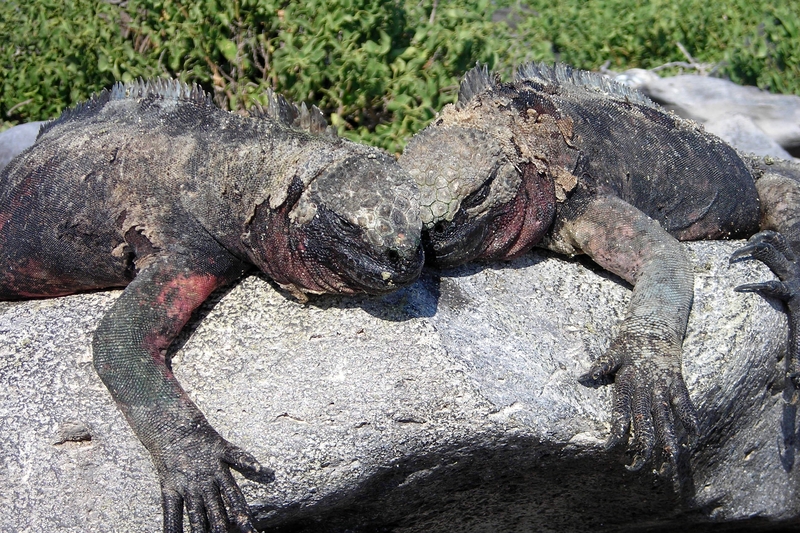 Two marine iguanas bask in the midday sun. Nothing better than lying around with a friend on a summer’s day. But attractive sunbathers these guys are not. Marine iguanas feed in the ocean, drinking salt water and eating saltwater algae, so to help keep their bodily salt concentrations in balance they sneeze out salt, which crusts on their faces. Their bodies are mostly dark grey, to blend with the rocks and absorb heat quickly, but do exhibit a wide range of coloration, with some variation between the groups on different islands. These guys have red patches, common on Española. They also shed their skin in patches, adding to their mottled appearance.